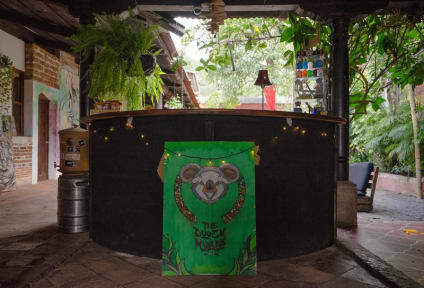 The hostel The Doozy Koala is housed within a sprawling traditional Antiguan house with a semi-private courtyard and beer garden. The open and flowing layout encourages community interactions while still allowing opportunities for privacy and relaxation. The fusion of Guatemalan and Australian cultures has created a unique space that is highly creative and welcoming of people from all over the world. The hostel is located inside the center grid of Antigua, in the northeast end direction. We are five 4.5 blocks walking distance away from Central Park. The surrounding area also offer the unique village of Hobbitenango, overnight and day time hikes upon Acatenango or (active) Pacaya volcanoes, day trips to the black sand beaches of El Paredon or Monterrico, the amazingly beautiful Lago de Atitlan and the natural pools of Semuc Champey in Lanquin. We offer two in-house bars, front bar with courtyard and back bar with playground, our very own restaurant open for guests and public, chill area with hammocks, ping-pong and pool table available. Our dorms our equipped with large lockers, power socket and night light_in each bed, with fresh linen. Come and immerse yourself in the Guatemalan culture, we're in the thick of it all. Comfy rooms, great staff, bar & area to hang out in the sun. Perfect place to meet some party peeps and fellow Aussie travelers. Loved it. Great food, great facilities, cool atmosphere and the private room for me and my girlfriend felt like a hotel room! We stayed at another hostel in Antigua previously and wished we spent more time there. Best hostel we have stayed at!! Awesome staff, INCREDIBLE food, awesome atmosphere - I can’t recommend this place enough! Also great location. One of the best, if not the best hostel I’ve stayed in. Staff are great, food is so yummy, beds are clean and the atmosphere is phenomenal (we were there for Australia Day) but before a Saturday pool party there’s always a crowd which is super fun- AND the dogs are Koalita the kitten are amazing. One of the best hostels I've ever stayed in, the owner Will, as well as all the staff and volunteers, are absolute legends and go out of their way to help with anything you need. Also, best shower I've had yet in central America. And the food is amazing. Literally no problems during our stay. Highly recommend. Great place providing exactly what it says it will. Hot showers are great and good balance between chill and party vibe.